The title of this post says it all… today, I’m going to show you, step-by-step, how to spiralize a butternut squash. Many of you asked me for a tutorial after Monday’s and Tuesday’s post, and I’m happy you did! To start off, let’s make sure we are spiralizing the right shape of butternut squash. 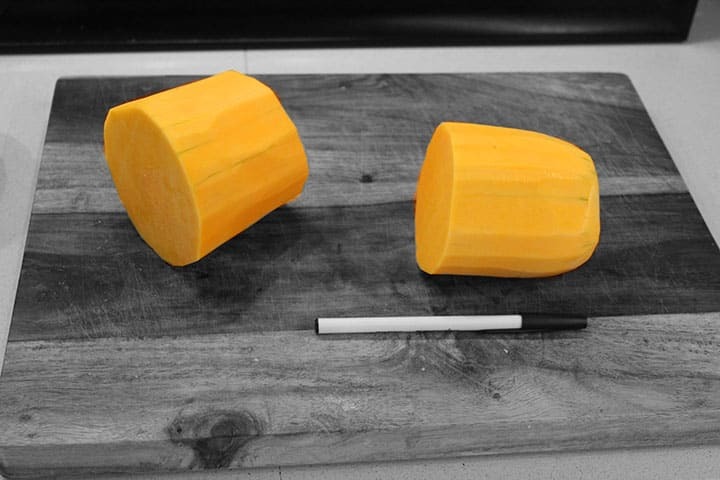 As I mentioned on Monday, choose a butternut squash that is as evenly cylindrical as possible. Big bulbous bottoms are not favorable here. Ha, I chuckled to myself writing that sentence. Tehe. 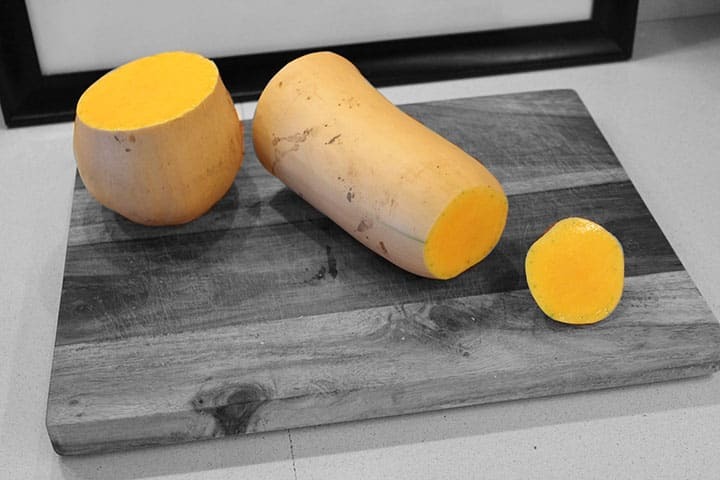 The bottoms of the squashes (where they get wider) are where the seeds are and that part cannot be spiralized. The picture at the top of this post is the ideal size for spiralizing. Once you’ve got your squash, cut the bulbous end off. 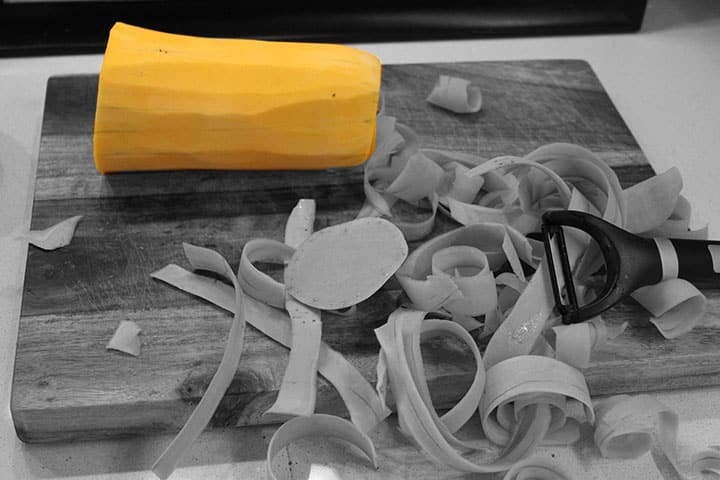 Next, cut off the opposite end of the part of the squash you will be using. Now, peel the squash, trying to get rid of all the green parts so that the tough outer skin is completely removed. I’m not going to sugar coat this part, it’s obnoxious. It takes a little bit of time (about 5 minutes) and you may have to peel multiple layers off before the orange inside skin pops through. This vegetable is now about 6 inches long. You’re going to want to cut it in half to about 3 inches to make it easier to spiralize, like you would with any vegetable. The pen is for perspective, obviously. Time to spiralize! Load one of the halves into the spiralizer. Press the teeth of the handle into the squash so that it is secure. When you spiralize, use the bottom handle for leverage and push while you crank the other handle. Lastly, keep in mind that butternut squash noodles are firmer than zucchini noodles. They take longer to cook in a skillet (about 5-7 minutes to soften). UPDATE: Another way to cook the noodles is to roast them at 400 degrees for 5 minutes before putting them in with a sauce. The sweetness comes out more! Other than that, you’re ready to go! Do you have any other question about spiralizing a butternut squash? Was this tutorial helpful? I've found that if you pierce the squash a few times and microwave it only for 2 mins, it makes it much easier to peel and it won't make the squash mushy before you start cooking. That's a great tip! I'll have to share that next time with my readers... I don't own a microwave though, so I can't really test it! Sad, right? Thanks for the tip! I bet you could accomplish the same by wrapping the squash in some foil and putting it in the oven at maybe 375 for 5-10 mins... really all you are doing is softening the outer skin connection to the squashy 'meat'. Might have to give that idea a try! I usually boil butternut squash for less than a minute before peeling - makes it so much easier, and the flesh doesn't have time to cook! Tamara - thank you so much! Open your spiralizer, it'll change the way you enjoy vegetables, I promise! it certainly is changing the way I enjoy vegetables. There's no need to go the gym when you've spiralized a squash! Thank you!!! Hoping I get one in my farm box this week...if not will be getting one at the store. Squee! Bethany - yay! 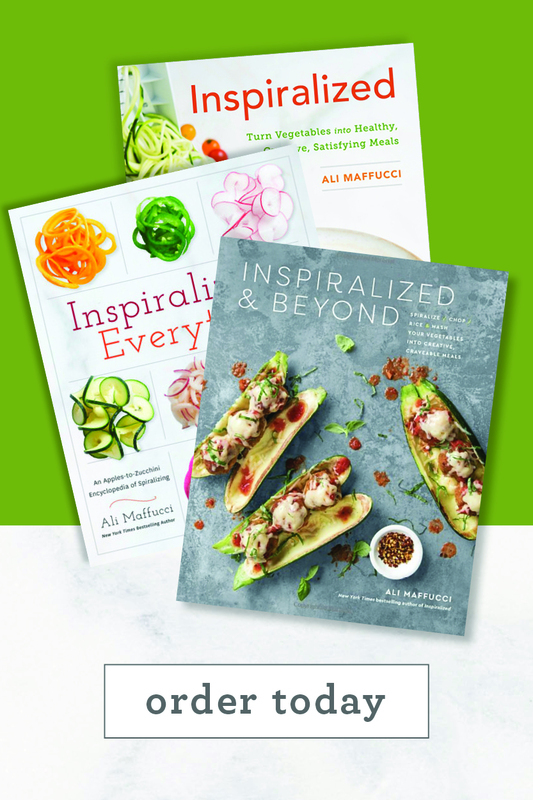 Can't wait for you to start spiralizing! Awesome! I just bought my spiralizer and I cannot get enough. So glad I found your blog because the recipes are endless. Thank you! 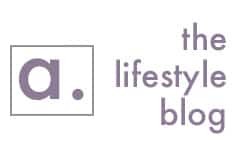 Maria - I'm so happy you found my blog- happy spiralizing! I recently found your blog and am totally amazed by all the veggies that can be made into noodles. The recipes look amazing. 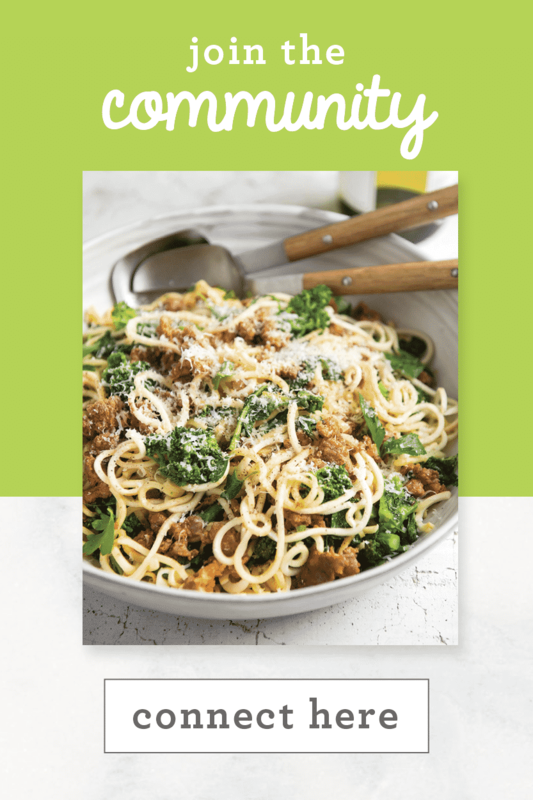 I plan to buy a spiralizer this weekend and start creating some of those wonderful recipes. A number of my family members have celiac and we do not eat wheat pastas so this will open up a whole new world. Thanks so much. I'm brand new to your site, having found you on Foodgawker. I'm a carb ADDICT (and I mean, HORRIBLE addict) who's trying to lose 50 pounds by my 50th birthday #FitBy50 I bought a spiralizer about 3 weeks ago at the suggestion that zucchini noodles will soon become my best friend, but I haven't taken it out of the box yet. I adore winter squash, so I'll have to give this a try. I agree though... danged skins! Becca - yay! I'm so glad that you're on a get-healthy kick! Spiralizing definitely helps... although my downfall is definitely chocolate! Let me know about your journey! 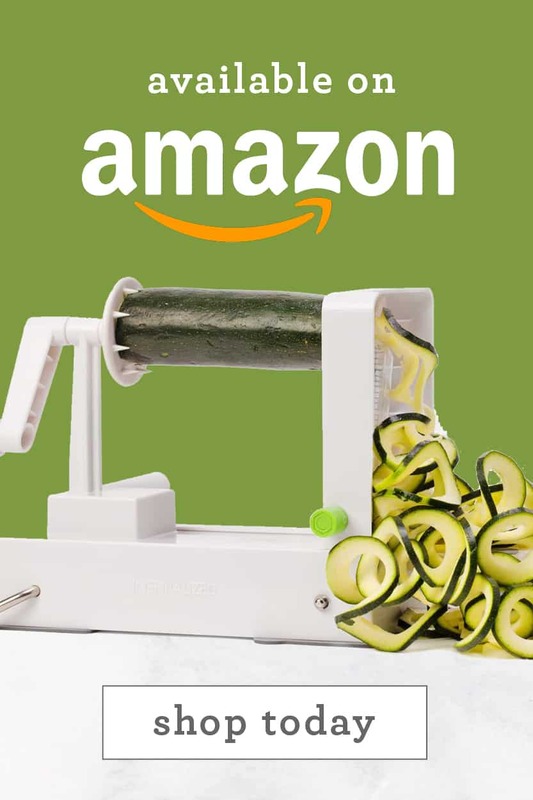 I got my spiralizer over the weekend and have gone through six zucchinis and 1 squash already! I made homemade meatballs and sauce and brought in 'spaghetti' and meatballs for a friend for lunch. He recognized the zucchini from the green skin but kept asking "But what is the rest of the pasta?" to which I replied, "There is no pasta - it's all zucchini!" I'm thrilled. My husband did the same thing....he thought it was zucchini mixed in with pasta! I can't remember, did your review about storing noodles include butternut squash? I'm thinking they might store a bit better than zucchini noodles, but it's just speculation on my part. I might be inclined to simply wrap the leftover prepped butternut (unspiralized) in some plastic wrap and refrigerate that for later use. I'm looking forward to trying some butternut squash noodles! never tried before, nice pictures! So in agreement about the images...LOVE the contrasting of the black & white/color shots to highlight the spiralized butternut! !...Very effective and so amazingly lovely to view!! I LOVE your blog and follow you on instagram. 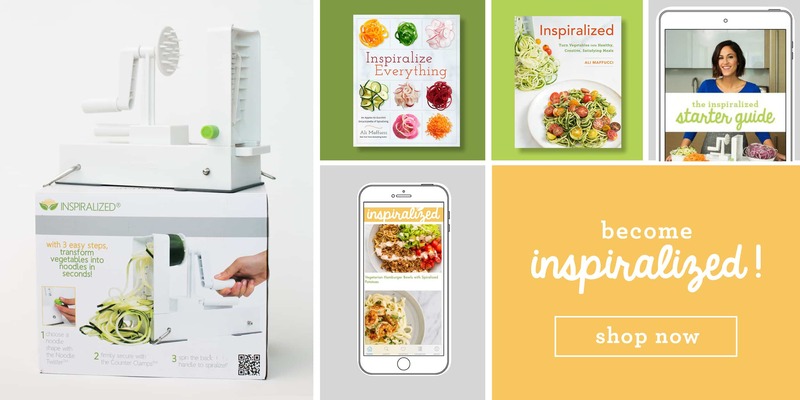 I think this is such a creative way to cook and I just received my spiralizer! I'm making your butternut squash noodles with the asparagus, mushrooms and poached egg tonight for dinner and to save time do you recommend spiralizing the squash before hand? If I do it now and then refrigerate it until 8:00 (or so) will it keep its flavor, etc.? Let me know! 2 things: 1)I wish I had an indoor greenhouse that I could grow things I love all year and sadly, I live in Michigan so that is a pipedream! Need too many UV lights and the neighbors will probably think I'm doing something illegal(you can see how this could get out of control! lol), 2) I love the tips on how to Spiralize the veggies I've come to crave through your blog and DELICIOUS recipes you post!! Merry Christmas and keep the yummy food coming. 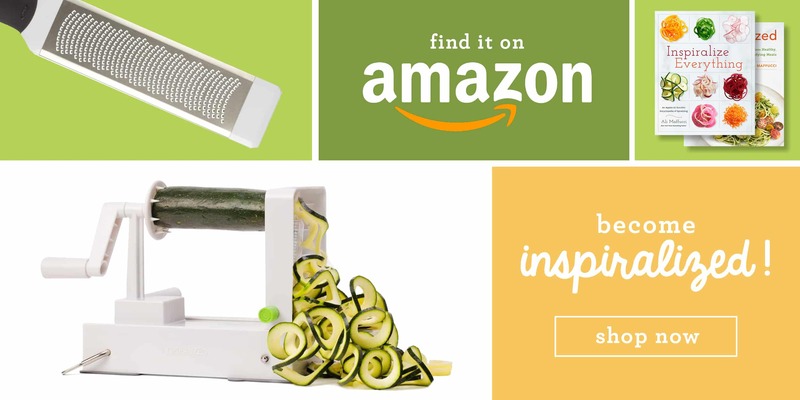 Your use of the Spiralizer is really a great vision you brought to life. Great job! Tried my spiralizer for the first time...and it wasn't at all what I expected. The noodles were still connected and I had to go and separate each noodle. I don't know where I went wrong. Oh no - perhaps you used the wrong blade or were not putting enough pressure into the spiralizer? They shouldn't stick together! Hmm. Feel free to send me pictures/videos at [email protected]! Mine did the same thing! I got inch-wide ribbons that were scored where the noodles should have been cut. It was so disappointing! Forget using a peeler on these. 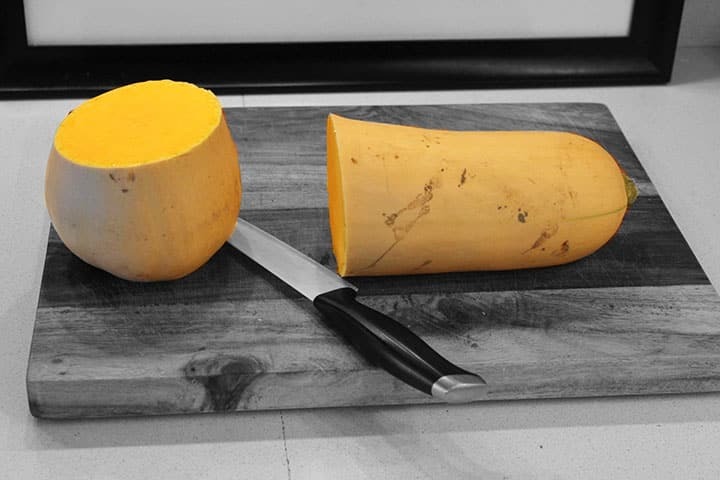 Once you've cut the ends off your squash just set it upright on the cutting board and use the same big knife you used to cut the ends off to slice thick sections of the skin off, rotating the squash as you work your way around it. It's so much easier and faster than a peeler. You've definately inspiralized me Ali! I just bought myself a spiralizer and have LOVED making some of your courgette noodle recipies :) But when I tried a butternut squash I had the same problem as Shante... All the noodles were stuck together and didnt seems to be properly cut so I spent 20 minutes trying to peel them apart and couldn't even seperate some of them :( have you ever had this problem or have any tips? I hope I can use buttnut squash in the future! Thank you from the UK! Steph - I have had this issue before - sometimes using Blade B can help but otherwise - make sure to use a lot of pressure into the blade when spiralizing and spiralize quickly. Speed and pressure helps! Quick question....Can you freeze butternut squash noodles before cooking? I saw on another blog that it worked with sweet potato noodles, but I am wondering if anyone has ever tried to freeze raw butternut squash noodles? Any advise welcome...I am all about the prepping so I barely have to do anything during the week for dinner! Hi! I love your site! I just spiraled beets for the first time today! 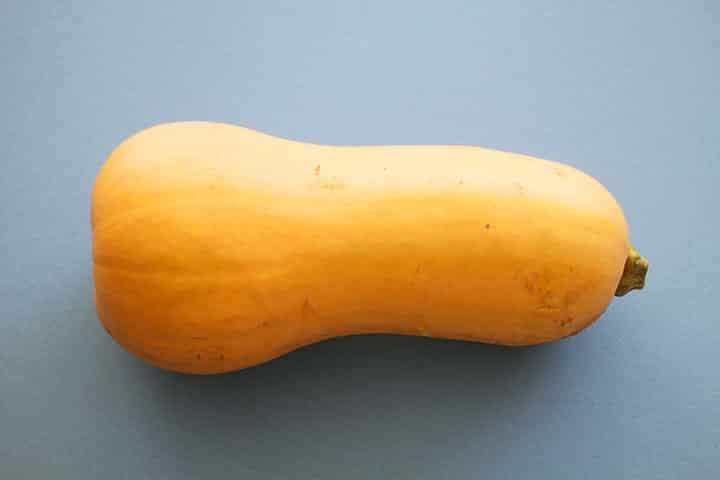 I was curious if you ever spiralize the bulbous bottom part of the butternut squash? Not sure what to do with it.. Thanks for your comment! I do not spiralize the bottom, I usually dice whatever is left over from it (it's seed-y so there's not much leftover "meat") and I roast it to use in salads later. THanks for the question! I was recently told by a dr. to go gluten free- dairy free- I have been living on your site and have eaten more veggies in the last month then I have in my entire life! Ive been using the spiralizer and loving it- but the butternut squash didn't work- it cam out in giant stirs and you can see the spiral lines but it didn't cut through- what did I do wrong? also- can I spiralize my vegetables for the week and use them as I need them each night? thanks!!! How do you store the raw spiralized noodles if you want to prep ahead of time? Thanks, Dee! Let me know if you have anything you'd like in a tutorial! What sauce do you recommend with spiralized butternut squash? I like browned butter with sage! Homemade marinara was perfect on butternut noodles, topped with Parmesan cheese. Do the spiralizes noodles save? Say I'm doing food prep in the morning and want to cook the noodles later. Will they keep or do they get soggy? I am so disappointed! I have been loving my spiralizer for zucchini and just tried spiralizing a butternut squash. I tried the plain blade and it wouldn't catch at all. Then I tried the skinny and not so skinny noodle blades and while I got some cut, it just sort of turned to mush. Maybe because my squash has been in storage since harvest (it is a locally grown squash from Hadley, MA and so probably harvested late last fall) and it is too soft? I have trouble doing butternut squash as it doesn't seem to stick to the spiky bit of my spiralizer. It does a few curls then the spiky bit spins on the squash when I turn making a spiraly indent but not turning the squash. I can carry on making spirals by turning squash with my hand but not sure what I am doing wrong. Doesn't happen with courgettes. Thanks for any advice. Now can you cut if you do not have a spiral? 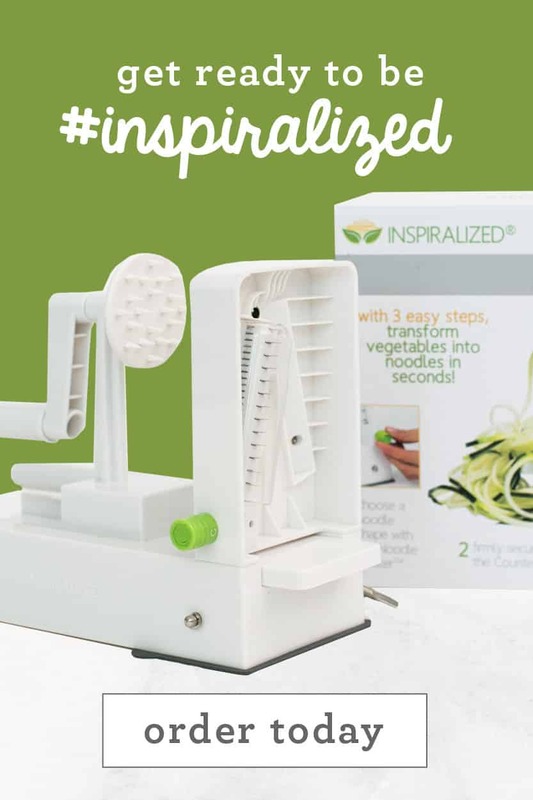 Just got my Inspiralizer last night - the only thing that I could make noodles out of was the zucchini, both the butternut squash and turnip stopped working, and just turned against the machine without cutting after the first couple of turns. I am sure it has to be something I am doing wrong. Help! My first experience with the spiralizer was a succes (zuchinni and potatoe and banana for baking, loved it ) but just tried the butternut squash and that is a big disappointment. It doesn't stay on the spike, the handle to turn the squash seemed close to breaking, and the knives do not separate the spirals. Had to break them by hand afterwards, for most of them that wasn't even possible and 70% of the squash is reduced to something I can only throw in the liquifier to make a soup. Which I didn't want to prepare and eat to begin with. Also a bit of a pity (in 2016) that the spiralizer is made for right handed people. Monique, this doesn't sound right!! 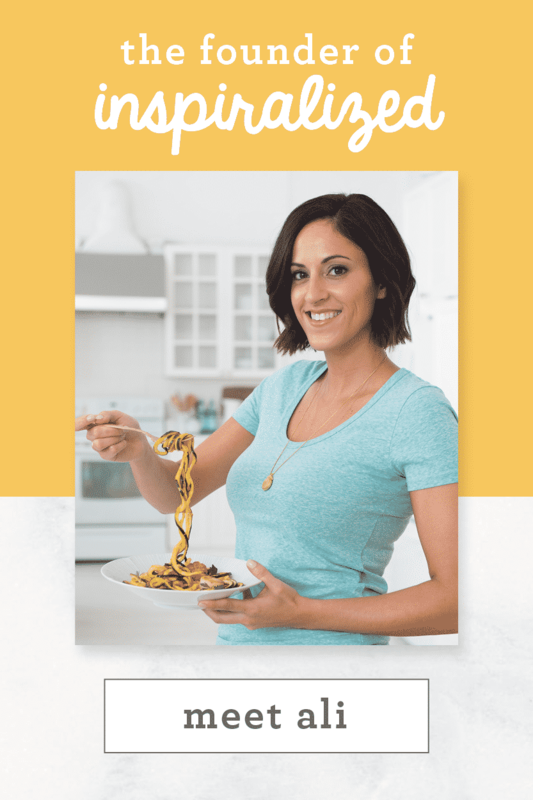 What kind of spiralizer do you have? Feel free to email [email protected] and we can help you troubleshoot! 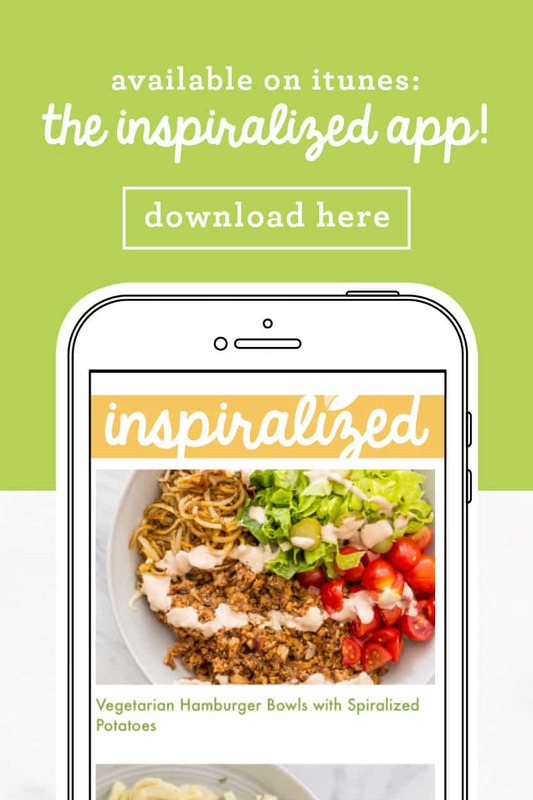 Absolutely love my spiralizer and your site! Spiralized some butternut squash today and your tutorial was so helpful! I made a casserole with chicken, peppers, onions, pesto, and cheese. So easy and amazing (although the squash was definitely the most difficult thing I've spiralized so far.). The spiralizer has been my health-kick's best friend. 15 lbs down since Christmas! I will have to make the spiralized noodles the day before. It was hard for me to turn the machine and work to clean up. I tire easily and am not strong. Otherwise, the dinner turned out great! What brand of spirals we are you using? I just got one but it didn't work for butternut squash. Just what I needed, I was always trying to figure out how to do this!. Hi Joanne, we recommend giving it another shot with a different squash. Those centers can sometimes be a bit too soft. If the issue continues, reach out to me - [email protected] - and I can troubleshoot with you some more!! I have a veggie bullet. Can I use this instead.? We do not use the veggie bullet, so we can not say. We recommend checking the manual to see what veggies you can spiralize with it. If you have a KitchenAid there’s a KitchenAid spiralizer attachment that’s lovely! Just did this on a Kitchen Aid w/ spiral cutter attachment. So guess what my wife is having for supper? With home made spaghetti sauce of course and a great garden salad. I had a hard time using the spitalizer on a butternut squash, the first time, until I read some comments above. I found all this info really useful. Thanks everybody. I succeeded in spiralizing my squash and now I know what to do. By the way, I found it very easy to peel with my Tupperware peeler. It is excellent to peel everything, and I’ve had it a very Lon time. I just was successful with my first attempt at spiralizing a butternut squash, thanks to all the comments and tips. I was having difficulty until I read some of the comments. I also want to point out that it was very easy to peel with my Tupperware peeler. I can peel anything with that peeler and I’ve had it for years. Thank you so much for individual information. 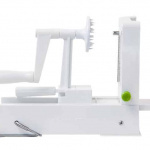 I just bought myself a spiralizer.I have LOVED making some of your noodle peeler recipies :) But when I tried a butternut squash and I easily made noodle peeler into few minutes for this way. I tell to other users to visit this site.